This entry is part 1 of 3 in the series Confess & Believe. So what does it mean to be a follower of Jesus? What does it look like? Is there an easy way to sum it all up in just a word or two? The first idea of confession is that we come to God and confess our sins to Him. We acknowledge our brokenness and our need for a Savior. It’s understanding that, on our own, we cannot save ourselves. We need God to do the rescuing for us. 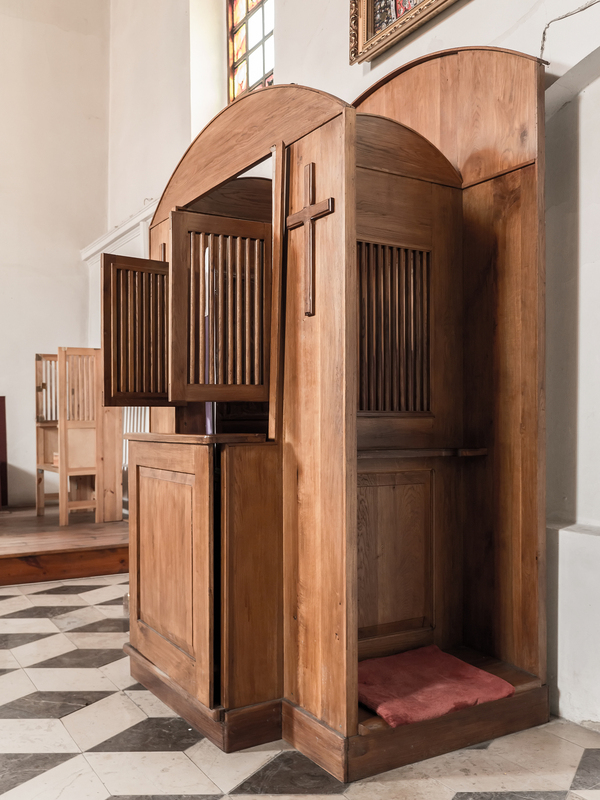 Normally when people think of confession this way, they think of a big wooden box standing inside a Roman Catholic church. Sadly, most people have a negative reaction to this sort of thing. Call it a holdover from the Reformation or whatever, but I think we miss out on a great thing when we avoid personal confession. When I was in college, I attended a retreat for guys who were planning on becoming pastors. At this retreat, there was a local pastor who, at one point, announced that he was going to go up to the sanctuary and hear confessions. If anyone wanted to take advantage of that, he would be there. At first, I thought that was weird. We were all Lutheran, after all, and confession isn’t something that we do. It’s not a part of our deal, y’know? But the more I thought about it, the more I realized that I was carrying a load of guilt over some old sins. They had been nagging at me and nagging at me. So finally, nervously, I went up to the sanctuary. I won’t speak of what the sins were. But I was able to unburden myself and I was told directly that those sins, those sins that I had been carrying around with me, were forgiven by Christ’s sacrifice. And it felt so good. The guilt lifted and I knew that they were gone. I’ve listened to confessions from people from time to time and it’s always been my great privilege to let my brothers and sisters know that they are forgiven by Christ. If you haven’t experienced this, I want to encourage you to do so. The old cliche says that “Confession is good for the soul.” And I’d be the first to tell you that it absolutely is. Come before God. Unburden your soul. Confess and see what His forgiveness can do to make you free. If we are saved by confessing but justified by believing, is it possible to be justified without being saved? Perhaps by people who haven’t had a chance to respond to the Gospel? Growing up Baptist I haven’t learned a lot about Lutheran practice, so it doesn’t necessarily sound weird to me that you would do confessions. I’ve thought about becoming Lutheran because I wonder if Lutheranism might be less about being saved all the time. I always struggle with the concept of “saved.” But I can’t believe that the external act of baptism can result in salvation any more objectively than the literal act of praying a prayer. Or, for that matter, the act of saying a confession to a priest/pastor. I’m curious what you mean by “Lutheranism might be less about being saved all the time.” If you mean, do we do altar calls and stuff like that, yeah, we do tend to downplay that sort of thing. We get a bit nervous at any hint of contributing anything to the process of being saved (i.e. making the decision, etc.). For Lutherans, we talk about baptism being the water connected with the Word of promise (such as Romans 6 or 1 Peter 3:21-22), so it’s not something that we do but it is the way that God has chosen to initiate a relationship with us (the fancy term we use for that is that baptism is a “means of grace”). The same thing is true when it comes to confessing. It’s not that the priest/pastor is the one doing the forgiving. Well, he is, but he’s doing it on behalf of Jesus. It feels a little artificial to view the whole world as either saved or unsaved. Even when not the main topic, the state of being saved is always a subtext of the sermons I’m exposed to. Saved or unsaved relates to everything in some way, and I have a strong sense that all my spiritual upbringing teaches that Christians must be constantly aware of saved or unsaved at all times. The salvation state of individuals is by far the most important concern, maybe the only concern that matters. My scrupulous perfectionism and my propensity for depression has made this a huge stumbling block for me. For Lutherans, we talk about baptism being the water connected with the Word of promise (such as Romans 6 or 1 Peter 3:21-22), so it’s not something that we do but it is the way that God has chosen to initiate a relationship with us (the fancy term we use for that is that baptism is a “means of grace”). I understand the second part, like C.S. Lewis said in Mere Christianity that we need to make use of the means of grace, even though God could save people by other means if He wanted to. Baptists don’t have any official “means of grace,” (of course unofficially there’s the sinner’s prayer) but knowing objectively that one was saved is still held to be important. “Word of promise” = Bible, I take it. I see what you mean. Lutherans still think in terms of “saved” or “unsaved,” but I don’t know if it’s to the extent that you’re describing. Hard to say for sure. Word of promise does indeed mean the Biblical promises that we see regarding Baptism.